The Sleeping Bear Dunes encompass epic beauty. 450’ tall bluffs, nearly endless sandy beaches, lively forests with rare plants and animals, and crystal clear inland lakes can all be found within the park. The trails and roads through the park are well known for their number of great views. Many of these views can be seen from the car or a short walk down a trail. With so many easily accessible lookouts it might seem easy to see all the park has to offer. That could not be farther from the truth. Many secrets are hidden deep within the Sleeping Bear Dunes. Sprawling fields atop towering dunes, ghost forests from ages past, and ever evolving wind swept sand bowls and channels. These are but a few surprises awaiting the adventurer who will venture off the beaten path. 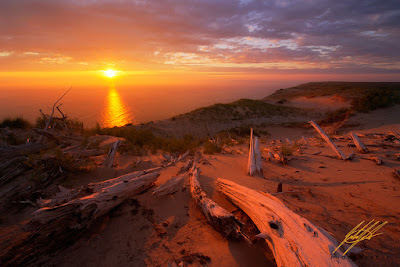 “Kingdom of Light” contains many of the rarely seen elements found within the Sleeping Bear Dunes. The location features one of the largest ghost forests within the park. The ghost forest sits nestled in an eroded bowl just below a large grassy knoll known as the resting spot of the sleeping bear from the legend. The area is miles away from any marked trail, however is well worth the effort. After hiking to this location countless times, I was finally given an opportunity to photograph this scene in a very rare lighting situation. The dense cloud cover gave way for the sun to slip through creating direct lighting and reflected lighting. The direst lighting cast shadows creating depth. The reflected lighting (caused by the sun hitting the underside of the clouds) was intensely saturated. I was ecstatic to capture an image that I believe represents the scale and beauty of the Sleeping Bear Dunes National Lakeshore. Technical details: Canon 6D, Nikon 14-24 f/2.8G ED lens (@14mm), Novoflex Canon EOS to Nikon G adapter, ISO 100, Three photographs taken at F/11 to capture complete shadow and highlight detail and retain sharpness (1/8, 1/4, and ½ of a second). One photograph taken at F/22 to obtain sunstar effect, exposed for the sky (1/5 of a second). © Julian Bunker Photography. Simple theme. Powered by Blogger.